Fresh Coat of Paint: Nailed It! So we have now spent four nights in our new/old house... and it's anything but luxurious! 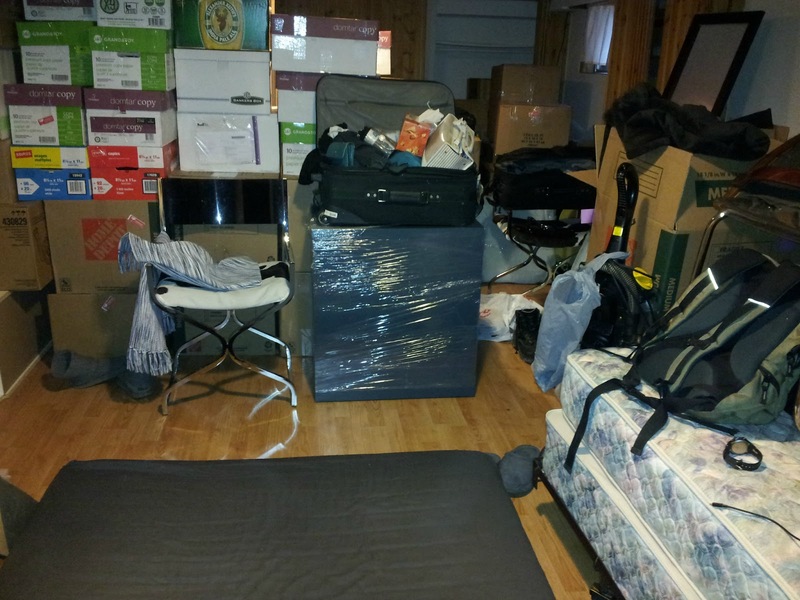 Until our floors are complete, we can't move our furniture upstairs so we're living/storing everything in the basement. Here's a little picture so you can see that I'm not exaggerating. By the way, that box spring is NOT our bed. It was left by the previous owners and while we think it's probably fine... we won't sleep on it so we lost even more floor space downstairs. We're still figuring out how we're going to get it outside since we think it was brought downstairs before the kitchen was finished. With all the work that needs to be done, we're obviously trying to save as much money as possible. We had hired Mr. Sandless on Friday and, after seeing our sleeping quarters, he told us that he would squeeze us in for Monday. More on that later. We told him that we were really on a budget and he told us that the best way to save money would be to remove the existing floors ourselves. Our deadline for the main floor was this morning at 7. I'll talk more about the condition of our floors in another post. Anyway, our "adventure" began Friday night, when Corey began to remove a badly damaged tile in our front entrance hallway. We hadn't planned to expose hardwood there because we could see tile underneath. The top layer was not salvageable so we decided to try to clean the layer underneath. But, once we had removed the top layer, we noticed that the floor was still higher than it should be. Carefully, we lifted the bottom layer of tile using a screwdriver and a hammer... and occasionally a crowbar for the tough spots. To our surprise, there was hardwood underneath so we just... kept going. The only snag was this spot (below) where there had been an old return. Yesterday, we woke up early to begin our living room and dining room. Corey had already started working in the dining room on moving day... just to make sure that the hardwood we had been dreaming of was actually there. We encountered our first challenge when we realized that the particle board subfloor was nailed down obsessively to our beautiful hardwood. We wanted to minimize damage to our floors which would be caused by prying up the subfloor, so we began the tedious process of lifting each nail individually. This meant chiseling down around the nail with a flat head screwdriver, twisting to try to pull the nail up a little and then using the back of a hammer. Some nails took some serious work to pull up. The living room was completed after diligently working until 2:00. When we began the dining room after lunch, we expected it to be similar to the living room. We couldn't have been more wrong. The dining room was actually raised about two inches above the living room. This was due to the many layers of flooring we had to work through to get to our hardwood. The top, was a simple laminate. Then came some parquet (which was nailed, glued and plastered in some areas) which had a layer of plaster and metal lathe underneath. Under this was another particle board subfloor (with many nails into the hardwood again) and, in some areas, still more nailed down subfloor underneath before we could finally reach the hardwood. 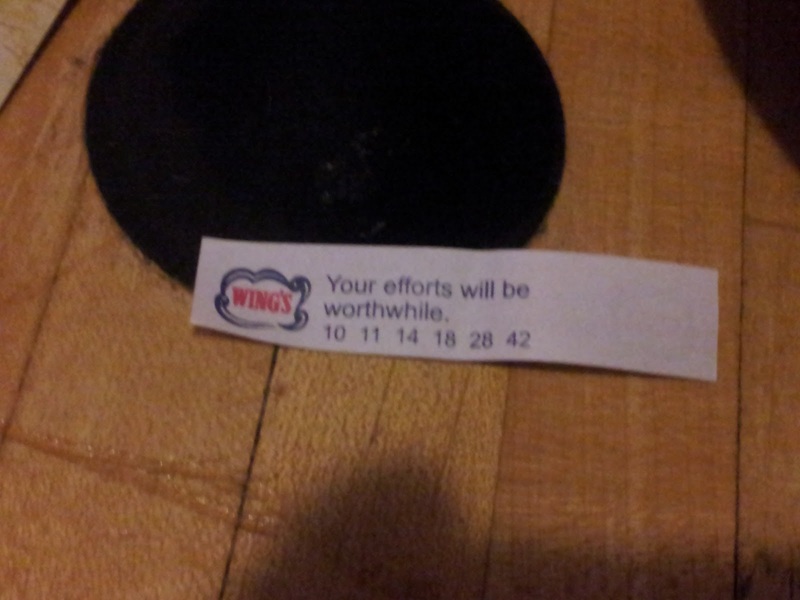 We hope so, wise fortune cookie! We really hope so! We powered through and finished a little after 3 this morning. 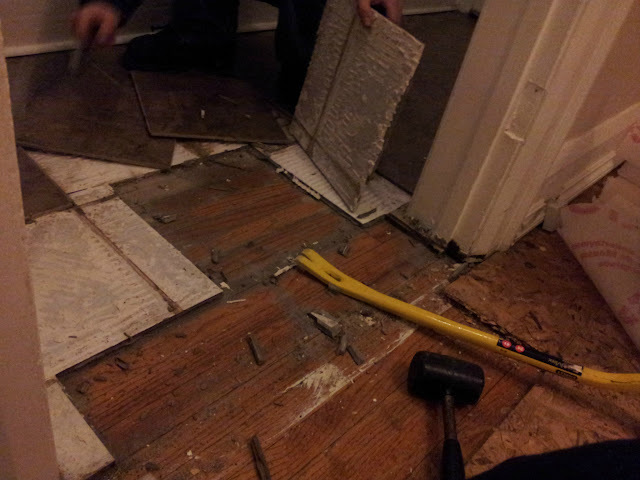 You'll see our finished floors soon, but I'll leave you with this picture of all the nails we removed last night. This is by far the most unexpectedly difficult home project we've tackled to date. I'm sure I'll be eating those words in a month or so though. Still, nothing feels better than working on your own home! Operation "Get Barkley Back" is well underway. Once the floors are finished and we can move upstairs, all we need to do is install stair runners (he's not very good on stairs) and dog-proof the back yard and he can come home! We miss him very much so we're pushing ourselves hard these next few days!